Starring Alicia Vikander, Dominic West, Walton Goggins, Daniel Wu, Kristin Scott Thomas, Nick Frost and Derek Jakobi. From a critical standpoint, the phrase ”better than most video-game adaptations” is a useful one, as it allows us to identify the exact juncture at which ‘damning with faint praise’ deteriorates into ”saying literally nothing at all”. Because deep down, even the most muted instances of ”faint praise” will contain a tiny sliver of flattery. Take this sentence for example; ”That was without a doubt, the best episode of The Walking Dead I have ever seen”. Now you might think that isn’t saying much (and it isn’t), but you have to admit that it does have some merit as a commendation. After all, it’s not outwardly derisive of the show and being the best episode of The Walking Dead is still a minor achievement. At the very least, you can expect decent gore effects and a passable set-piece or two. Hence, there is ”faint praise’ being bestowed. However, when a compliment is so negligible that it ceases to have any worth whatsoever, then it’s not even damning with faint praise anymore. It’s just an empty declaration, devoid of meaning and signifying nothing. Which is precisely why the statement ”better than most video game adaptations” could be so useful! Because there’s no praise here with which to damn anything. You couldn’t say less if you were in a vacuum! It’s a phrase that could serve as a handy reference point, indicating the exact moment at which applause becomes so tepid, that it ceases to qualify as applause at all, and turns into people listlessly clasping at their own hands. It could be the equivalent of how 7 is used as the neutral value for the pH Scale. Like pH7 this statement doesn’t fall on either side of the spectrum (good or bad), it’s just tasteless water. 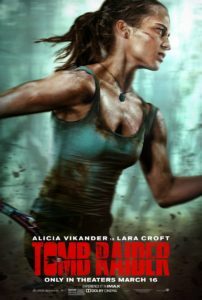 Speaking of bland and flavorless things, Tomb Raider (2017) is yet another video game adaptation hoping to break the infamous curse that is plaguing the genre! And what’s more, it might just be the best one yet… See!? That didn’t tell you anything did it? It meant absolutely bugger all. It was just a load of syllables written down on a page! To be fair then, Roar Uthaug’s (awesome name by the way) film is vastly superior to most video game movies and not just by virtue of being in-focus and largely coherent. 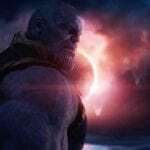 It has a fun sense of adventure, an evident affection for the source (specifically the gritty 2013 reboot) and a more grounded, survivalist take on the material, injecting the action with a little more peril. Still, there’s nothing that elevates it above distinct mediocrity as far as adventure flicks go. Sure, it will likely hold your attention for a couple of hours, but after its finished, it will fade from your memory quicker than your last bowel movement. It’s not a particularly dreadful film either, it’s just consistently underwhelming. 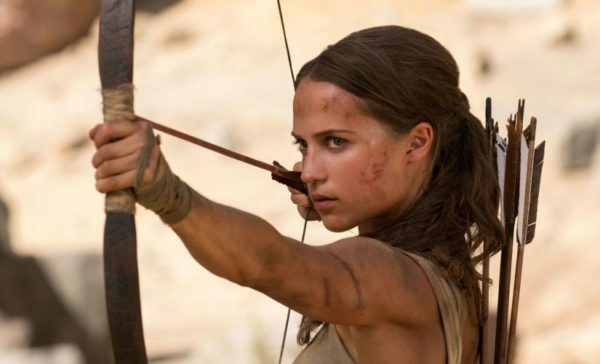 The most obvious instance of this would be with the character of the Lara herself (Alicia Vikander), who remains affable throughout, but never quite evolves into the truly compelling protagonist she could be. What’s frustrating about this is that the foundations are laid in the earlier scenes, wherein Lara is depicted as a lively presence; quick-witted, roguish and spunky in her interactions with others. You could argue that she short of falls into the ”cool stereotype” here, but at least that’s a character trait, one that Vikander is able to pull off with charisma to spare. Yet, as the film goes on, these likeable qualities are gradually chiselled away, beaten out of her by an increasingly bland script. Indeed, Lara’s journey curiously erodes at her sense of personality and eventually moulds her into an utterly formulaic and painfully serious angst machine; one who is content to do nothing but brood, scowl and occasionally deliver dry exposition. It’s a baffling move and as a result, we get the closest thing to anti-character development, wherein our hero becomes less interesting the more time you spend with her. Of course, none of this is Vikander’s fault. In fact, out of everyone here, she seems to be putting in the most effort, channelling a commendable energy into a performance that, frankly, the script doesn’t deserve. Her commitment to the role is apparent in every scene, especially the physically demanding ones and she is very convincing when it comes to charting Lara’s growing feelings of exhaustion and suffering. You really do believe that the adventure is taking its toll on her over the course of the film and that she is only surviving by the skin of her teeth. Elsewhere, everything is perfectly serviceable. The action is solid (albeit unspectacular), the pacing is taut, Tom Holkenborg provides a pulsating score, and the production value is impressive, with varied locations constantly spicing things up. But there’s a prevailing sense that everyone, Vikander not withstanding, settled for ”good enough” on this one. The dialogue, while never cringe-inducing, is impressively generic (Fill in the blank: ”This wasn’t designed to keep people out, it was designed to ___), the traps and puzzles are basic adventure serial affair (pressure plates, crumbling floors etc.) and the supernatural elements feel very obligatory and forced. In short, Tomb Raider can proudly distinguish itself from its video game movie competition, but only because of an appealing protagonist and some nice production values. Otherwise, the best thing that you can say about this, is that it meets the bare minimum you’d expect from an adventure film, functioning as a watered down version of Raiders of the Lost Ark. It’s totally unremarkable and completely inoffensive. It’s the pH 7 of cinema. It definitely borrows a bit too much from The Last Crusade (more so I though than Raiders), but it’s a fun movie. If anything, the supernatural stuff should have been played up even more, the 2013 game certainly doesn’t shy away from that stuff – Himiko’s power on the island is very real. The movie could have also used Sam and Jonah, but maybe if it gets a sequel she’ll meet them then. Oh I completely agree! When I said that the supernatural stuff felt obligatory and forced, I did not mean that it should have been removed. Instead, I was trying to say that the filmmakers did not appear to be interested in it and so awkwardly shoved it into the ending.